Paper-white of the most popular manufacturers and online printers - Proof.de - Fogra certified contract proofing - worldwide shipping. 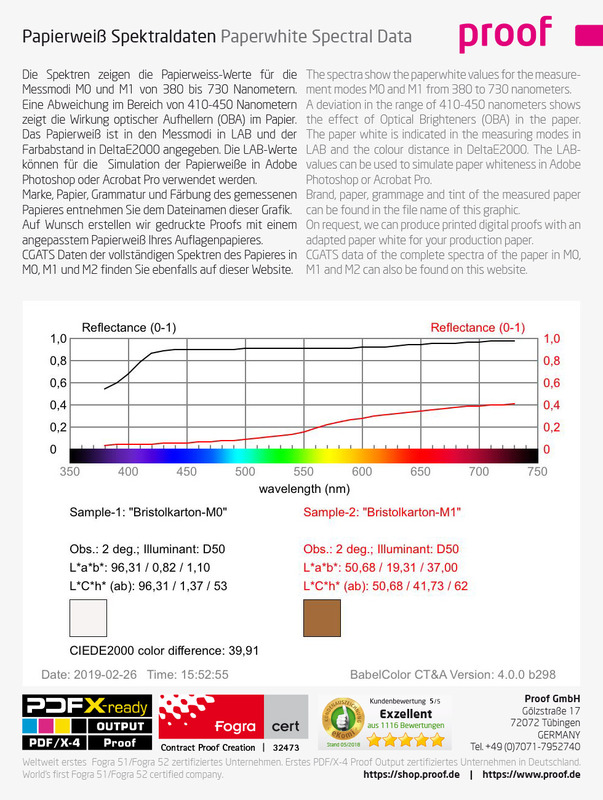 We have measured the paperwhite of the most common papers of well-known paper manufacturers and online printers and determined the proportion of Optical Brightning Agents (OBAs) in the papers. Using the data shown here, you can estimate very well how white an uncoated paper or how grey a recycled substrate really looks, and you can also display this directly using the paper white simulation in software such as Adobe Photoshop or Adobe Acrobat, in order to be able to evaluate a planned print in advance. If, for example, your new printing house suggests a different recycled paper, you can now research exactly to what extent the new grey tone corresponds to that of the previous paper, as long as you find both papers in the database. It is also possible to compare the papers of the most important online printers in Germany. We measured the paper white with an X-Rite i1-Pro2 in the measurement modes M0 (little excitation of the optical brighteners), M1 (new D50 light according to ISO 3664:2009) and M2 (UV cut), and determined the proportion of optical brighteners on the basis of the offset of the paper white on the B axis and output it as the measurement result in the last two columns. Are you missing papers and measurement results? You are welcome to send us missing papers. You are a paper manufacturer or printing house and would like to have your papers listed in our paperwhite database. Then feel free to contact us at any time.